Deep scratches on black dress shoes should be handled by a professional. 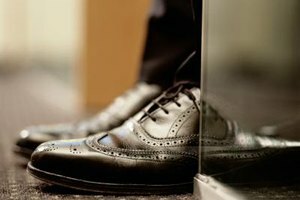 Black dress shoes spruce up a casual outfit or add the finishing touch to formal attire -- but if they’re covered in scratches, your look goes from classy to dingy. Your shoes may be scratched from everyday wear and tear, or maybe your cat decided to use them as a scratching post. With the right method and products, you can get rid of -- or at least hide -- light scratch marks on your black dress shoes. Wipe the shoes with a damp rag to remove dust and dirt from the surfaces, and then dry them with another clean rag. Moisten a clean rag with distilled white vinegar. Dab the vinegar onto the scratch marks. Let the shoes dry completely. Buff them gently with a rag and colorless shoe polish. Put a few drops of bath oil onto a clean rag. Rub the oil gently over the scratch marks to fade them. Buff the area with a clean, dry rag to remove the excess oil. Color in the scratch marks with a black crayon, permanent felt marker or acrylic paint. Put a light coating of the crayon, marker or paint over the scratch marks, and let it dry completely. Reapply the crayon, marker or paint as needed if the scratch begins to resurface. For deep gouges in dress shoes, consult a shoemaker.